Unai Emery has dished out the latest Arsenal injury news as his side prepare to continue their season in the Premier League on Tuesday night. The Spanish boss in his pre-match press conference confirmed that two defenders will be unfit to participate. Arsenal added to its already-ugly injury list when they played Manchester United in the fourth round of the FA Cup with two fresh injuries to Sokratis and Laurent Koscielny. The former went down in the 20th minute and had to be taken off to be replaced by Shkodran Mustafi. In Koscielny's case, it was an accidental discharge from Romelu Lukaku that led to facial bleeding for the Frenchman. All efforts to get him back to play were futile and after eight minutes of administering treatment to him, he was taken off. 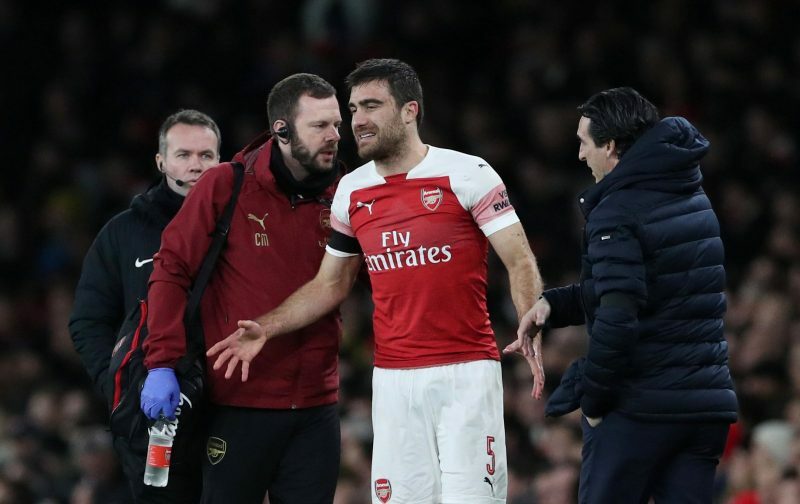 There was suspicion that the Arsenal captain could have broken his jaw in the accident but scans have revealed otherwise making it a minor injury for the centre-back. A quick return is expected though not as early as tonight. Sokratis' is also not a very serious one. Emery could not give a definite return date but predicted a two to three-week absence for the Greek maestro. Konstantinos Mavropanus has been playing for the U23 since returning from a five-month injury spell that has kept him out from the beginning of the season and could get a chance to feature for the Gunners in the absence of the senior centre-backs. So far, we have Rob Holding, Sokratis and Koscielny out of that position. The 21-year-old who has been training with the first team for weeks will be a better option in centre-back than the likes of Granit Xhaka, Nacho Monreal and Stephan Lichtsteiner who the manager may want to employ. That is all we have for you as regards Arsenal injury news for now. You can stay tuned to get updates on the progress of the affected players.